Click here to visit Annual Campaign site. The 2017 Annual Staff Campaign is taking place in all district buildings between now and November 17. Student-led fund-raisers will run November 6-17. The district’s annual employee giving campaign allows VPS employees to donate to nonprofit organizations which benefit VPS students. Employees can designation contributions through payroll deduction or other methods to the Foundation for Vancouver Public Schools, Citizen’s Committee for Good Schools, or the United Way of the Columbia-Willamette. During the 2016 campaign, over 50% of staff made a contribution, giving nearly $198,000. Of the total, $177,000 was designated to the Foundation for VPS. Student Chest Drives raised an additional $48,774 for the Foundation for VPS. Contributions made to the Annual Campaign are considered unrestricted gifts that allow the Foundation for VPS to directly fund students’ most pressing needs. During the 2016-17 school year, these contributions funded basic needs support in every school, provided mentoring programs, supported Family-Community Resource Center programming for families in need, and funded enrichment grants for innovative school projects. Several school buildings have kicked-off their staff campaigns. Employees at JPC and other administrative offices will have the opportunity to participate between November 6-17. Coordinators at each location plan activities and incentives to make the giving campaign fun and promote giving. Several businesses are providing incentives to encourage giving to the Foundation for VPS. iQ is sponsoring the Foundation for VPS campaign and donating up to $20,000 in matching funds. Mark Matthias, owner of Beaches Restaurant and Bar and Warehouse ’23, will host complimentary parties for donors at every school that achieves 50% participation or is in the top 25 schools in funds raised. Other businesses have donated gift cards or items to use as incentives. Additional information on the Annual Campaign supporting the Foundation for VPS can be found at foundationforvps.org/annual-campaign. Thank you to all VPS staff, parents and community members who make gifts to the Annual Campaign. 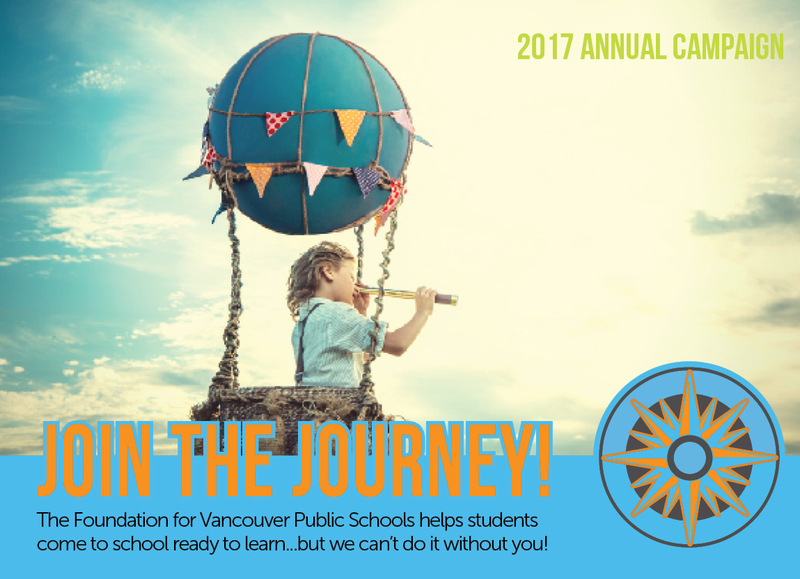 Your contributions help build a brighter future for the students of Vancouver Public Schools and for others throughout our community. School Grant Program Expanded for 2017-18. Applications due January 31.